The Bushey Family immigrated from Quebec, Canada in the late 1800's, and settled in Oswego, New York. Ira S. Bushey, much like Michael Moran, (who founded the Moran Towing Corporation) drove mules on the Erie Canal. In 1895, Bushey founded a boat repair business in Jersey City, New Jersey. In 1900, her relocated to Staten Island, New York. In 1905, Bushey reloacated to Brooklyn, New York in the Gowanus Canal, at the foot of Court Street. The shipyard was named, and was known as Ira S. Bushey and Sons Incorporated of Brooklyn, New York. The constructed new vessels for Bushey, the United States Government, and various other private owners, as well as repair work. In the early 1920's, the Bushey family elected to invest heavily in the fuel transportation business. Cars were starting to appear at a fast pace, and many homes, and factories were converting from coal to oil. On November 14th 1925, three partners Spencer, Toner, and Bushey formed the Spentonbush Fuel Transport Service Incorporated. Tugs and barges were built by Bushey to operate in the Erie Canal when it was open and in season to transport needed fuel to the upstate communities. These vessels, along with many coastal tankers (some built by Bushey), owned by the Spentonbush Fuel Transport Service delivered fuel up and down the Eastern Seaboard. In addition to the shipyard and Spentonbush, Bushey also owned the Sheridan Transportation Company of Philadelphia, Pennsylvania, and the Red Star Towing and Transportation Company of Brooklyn, New York. Both companies owning tugs and barges. 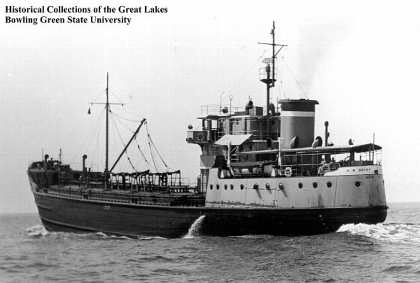 In 1931, the Patchogue Oil Company was added to the conglomerate. This company had oil terminals in Patchogue, New York. And the terminal in Brooklyn, New York on the Gowanus Canal next to the shipyard. ON June 24th 1977, the company was acquired by the Amerada Hess Corporation of New York, New York.